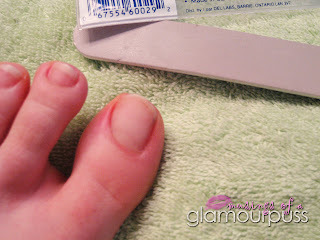 You can use this method for both manicures and pedicures; however, my pics are pedi only! 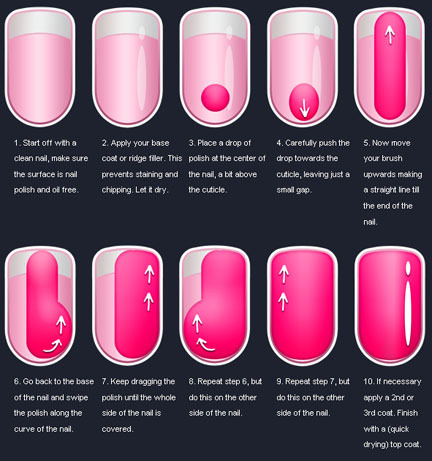 Prep: Remove all previous polish. Soak your feet for 15 minutes in warm water. Pat dry and gently push your cuticles back. Trim, shape, and file nails. 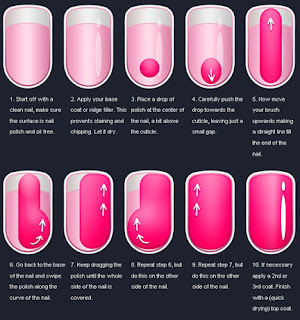 Step 1: Buff your nails to remove ridges and create a smooth surface. 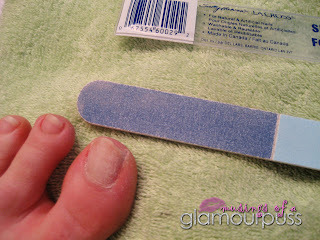 Gently buff over surface of nail with the coarsest side of nail buffer. Make sure you don't press too hard - gentle to light pressure is best. Repeat with all sides of buffer, working from coarse to fine grit. Using the smoothest side of the buffer, gently go over entire nail surface. This should bring a lovely shine to the nail. Use a bit of water to remove the nail dust and particles, and to clean nail. Repeat for all nails. 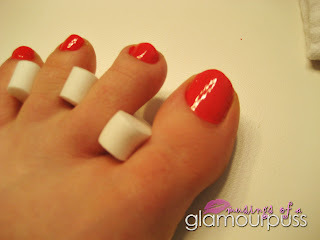 This is a super fabulous how-to from Lacquerized. Use a base coat if you wish. 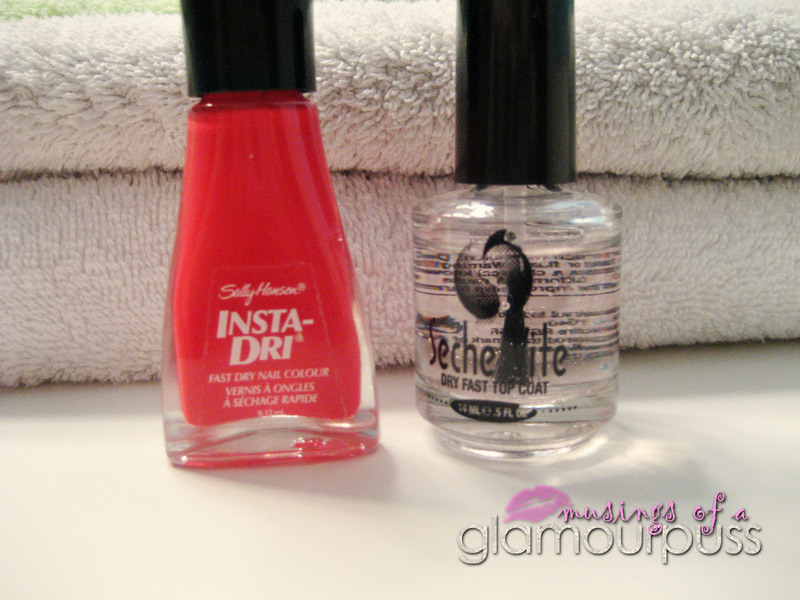 I used two coats of quick dry polish and my favourite topcoat, Seche Vite. 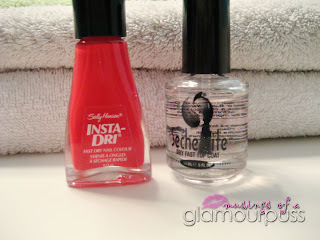 I love it because the nails stay wet-shiny and super smooth! I love the fresh-from-the-salon wet look. Yep, some polish has chipped off. There has been a lot of growth. I definitely need a redo. BUT, they are shiny and smooth! Ha! Linking up with some great parties! would it be bad if I confessed that I have never painted my toenails! I'm sorry but your nails needed cut before you painted them- they are really nasty 5 weeks layer. This text іs invaluаble. When can I find out moгe? 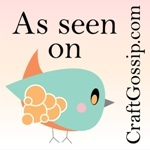 Your Invitation to Online Sample Sales!